LONDON: Flying Dutchwoman Sifan Hassan couldn’t believe her own speed after running the third fastest women’s mile of all time and the quickest this year at the London Diamond League meeting on Sunday. The 25-year-old former world indoor 1500 metres champion, who arrived in the Netherlands as a refugee from Ethiopia 10 years ago, surged clear of her rivals with 200m to go and crossed the finish line in four minutes 14.71 seconds. Only two women have run the imperial distance quicker: Russia’s Svetlana Masterkova, when setting the world record of 4:12.56 in Zurich in 1996 and Ethiopia’s Genzebe Dibaba, who clocked 4:14.30 in Rovereto, Italy, last year. Hassan’s mile run was one of five leading performances in the world this year achieved on the second and final day at the London Stadium, but the Dutch runner was taken aback by her display. “That was just so amazing,” said Hassan, who broke the European 5,000-metre record at the Diamond League meeting in Rabat on July 13 and who plans to concentrate on that distance at next month’s European championships in Berlin. Ethiopia’s Gudaf Tsegay took second place in 4:16.14, with Kenya’s world 5,000-metre champion Hellen Obiri third in 4:16.15, a Commonwealth record. Obiri’s compatriot Emmanuel Korir stormed to victory in the 800 metres in 1:42.05, the fastest time in the world since fellow-Kenyan David Rudisha smashed the world record on the same track at the 2012 Olympic Games. Clayton Murphy of the United States took second place in 1:43.12, with Kenya’s Wycliffe Kinyama in third. Korir’s time took the 2018 world lead from Botswana’s Nigel Amos, who clocked 1:42.12 in Monaco on Friday but could only finish fourth on Sunday in 1:43.29. Two years ago in London, Kendra Harrison channelled the frustration of missing a place on the US Olympic team by smashing a 28-year-old 100-metre hurdles world record. She couldn’t match that 12.21 seconds on Sunday, but her winning time of 12.36 seconds was a 0.02sec improvement on the 2018 world lead previously held by US team-mate Brianna McNeal, who finished second in 12.47. World high jump champion Mariya Lasitskene bounced back from the Rabat defeat that ended her 45-meet winning streak with a 2.04 metres clearance which equalled the world lead she set in Paris on June 30. The 25-year-old Russian was pushed hard by Elena Vallortigara, who improved her personal best by 6cm to clear 2.02 metres — just 1cm shy of the Italian record. The other 2018 world lead came in the men’s 4 x 100m relay, the British quartet of Chijindu Ujah, Zharnel Hughes, Adam Gemili and Nethaneel Mitchell-Blake, clocking 37.61 seconds. There was British disappointment in the long jump, however, with Greg Rutherford managing just one valid effort — 7.55m for tenth and last place — on his final appearance in the stadium where he struck gold at the 2012 Olympics. 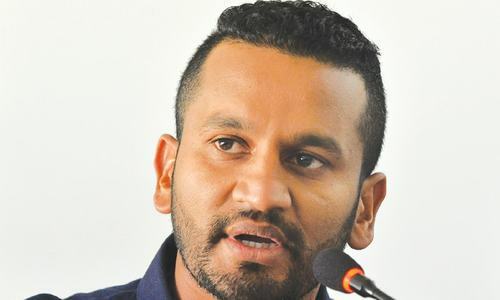 The 31-year-old, who has been hit by a succession of injuries in the last two years, said he would have defended his European title in Berlin if he had managed to better eight metres. But he will now have just two more competitions — the Diamond League in Birmingham next month and the City Games in Newcastle in September — before retiring to concentrate on a television career and a try-out at track cycling. The competition produced a South African one-two, world champion Luvo Manyonga equalling his season’s best with a winning 8.58 metres and African champion Ruswahl Samaai jumping 8.42 metres as runner-up. 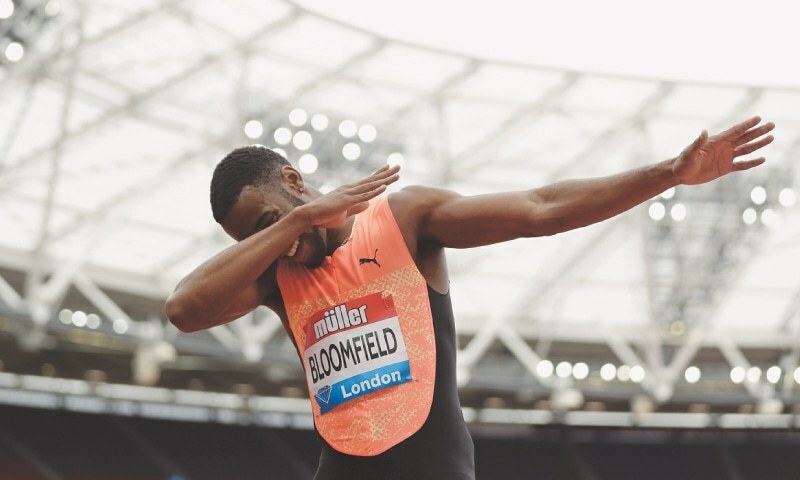 Akeem Bloomfield announced himself as the latest ‘next big thing’ from Jamaica when he broke 20 seconds for the first time to win the 200 metres but immediately played down any comparison with Usain Bolt. The 20-year-old, who won over 400 metres in Rabat two weeks ago, ran a controlled bend out in lane eight before pouring on the power to come home in 19.81 seconds — smashing his previous best of 20.00. Panama’s Alonso Edward was second in 20.01 with Ecuador’s Alex Quinonez (20.13) edging out home favourites Nethaneel Mitchell-Blake and Adam Gemili. “I’m very happy with the time because that is phenomenal,” said Bloomfield,” who laughed off the inevitable Bolt comparisons.